Wow…this week of planning a wedding has been amazing, and crazy, and fun, and super productive! If you were to ask me what my biggest accomplishment was this week, I’d tell you I FOUND MY DRESS – finally! 4 dress shops later and much debating over pricing, but I found what I love! There were several dresses that I really liked so kind of hard to choose, but I found one I wouldn’t have to alter too much and it is pretty much everything I’ve been looking for! My sweet mom and sister reminded me I will only get married once, so I should get a dress I really love – after all, I’ll be in that dress all day and it will be in every single picture. “Well”, I thought, “That make sense to me.” So I purchased my dress! Now I just need to find my shoes and then I can go in for my fitting and get marked for alterations! I met up with Michael later that day and we spent some time registering. Ok, seriously, it is so much fun figuring out what we want in our home! It was fun to see that we have similar tastes. 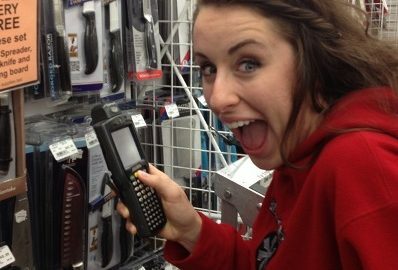 We went to Bed Bath & Beyond and did the scanning thing. It was Awesome! We are also registered on Amazon.com, but we haven’t finished that registration yet. We decided to get more of the linen and accessories (towels, bedding, oven mitts, bathroom rack thing, etc…) at Bed Bath & Beyond and then we’re getting everything else on Amazon.com. FYI: so Michael is a genius for thinking to register on Amazon because when you register there your guests can just purchase an item and it gets shipped directly to your house with no shipping costs! How convenient is that? We were glad to go to Bed Bath and Beyond for our more linen items though because we could physically touch the fabrics and see if we liked them, but Amazon is great for everything else. Some of the sisters (Michael’s and mine) have gotten their mint dresses – super cute!! Michael has been out of town for work again, but he was home in Salt Lake for a few hours in between trips so we went out to dinner together.